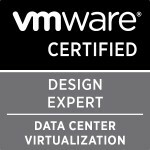 Just a quick posting about the recent news detailing the now released names of the new VMware exams to bridge the gap between the VCP and the VCDX as well as the VCDX4 official announcement. Scott Vessey’s (@vmtraining) blog details the names of the exams and the criteria for them and what he feels are good courses to prepare you for the exams. I won’t take anything away from his blog posting about it so read it here. I’m keeping a very keen eye on these as the gap between the VCP and the VCDX is a very large one and for someone like me who hasn’t gained the experience and expertise required to be able to defend my designs just yet it will enable me to grow my knowledge and also hopefully set me apart from the other 53,000 VCPs, of which over 15,000 are VCP4s and this was a figure from early February. Categories: Virtualisation | Tags: VCAP, VCDX, VCDX4, VCP, VCP4, vcp4 exam, vmtraining | Permalink.